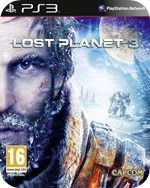 After the slightly frosty reception the thawed out first sequel received, it would seem the Lost Planet series has been pining for those long cold winters again. So the third game is a prequel to the original, taking place many years before. You are Jim, red-haired (finally!) and awesomely bearded-up for the cold. Jim has a wife and newborn son back on earth, but he’s taken this job on the frozen rock of E.D.N. III to earn some serious money as a Rig operator / go-to guy for exterminating the pesky Akrid wildlife while the NEVEC Corporation searches the planet for T-Energy. Rather than the Vital Suits of the last two games, you get to romp around in a 50-foot high walking Rig. 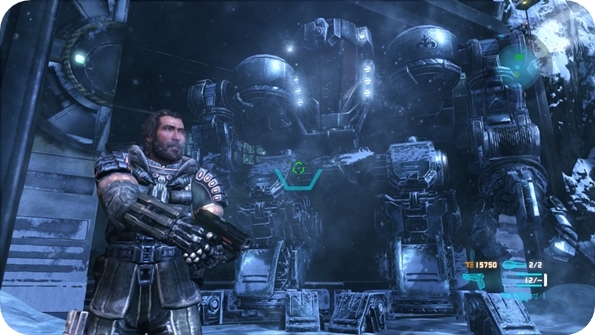 These huge mechs are essentially maintenance machines, hardly built for combat, but as you and Jim will find out, you’re stuck with what you have. Mechs are meant to be exciting. These rigs are making a play for dullest in class though. Limited to melee attacks like swinging arms, grabbing, blocking and a drill attacks, you’ll really miss those rockets and machine guns. Many of the boss fights force you into the Rig and you’ll have to time blocks against huge Akrid claws so you can counter with a grab enabling you to use your drill to wear down those telltale glowing parts. Rinse and repeat for all the boss fights in the rig. At least the loader battle in Aliens: Colonial Marines was brief. Moving around stages in the rig is miserably slow. Whether it is on your way to a side-mission or a regular one, it just feels like commuting to work and for the first few hours, you are, as you’re fixing pipes, picking up items and checking on other workers. Loading screens plague all sections of the game too, you can barely go a couple of minutes without seeing one. There’s no excuse for it either; there’s a hefty mandatory install and it shouldn’t need much time to load up this much ugly. I was suckered in by the opening cutscenes that feature some excellent character facial models though, which is something we usually see from in-house Capcom games (like the Resident Evil games) in cutscenes. It would seem Capcom lent some of their expertise to Spark. But not enough. When these richly detailed scenes finished I was dropped me into what turned out to be the in-game engine for the rest of the conversation. I could only recoil when I saw the sloppy replacements as the texture detail went AWOL and a horrible white sheen washed over everything. This set things up for the rest of the game really -bland textures and a lack of detail indoors and out. All except for key conversation cutscenes that would use the fancy engine again. They proved to be something to look forward to. Not just for the looks, but the quality of the voice acting, the script and story are all surprisingly enjoyable. In fact, they’re easily the best things about the game. Jim is a likable everyman hero and is surrounded by a clichéd but interesting crowd. From the Rig tech geek that adores him, to the arrogant French colleague and his boss who’s clearing covering something up. And the one-way video messages between Jim and his wife do an excellent job of showing the tenderness between the two over such a long distance and put solid reasoning behind Jim’s motivation for being so far from home. Ok, so back to actually playing the game. Outside of the rig, on-foot sections feel similar to past titles. Here you’re thankfully given some weapons rather than a spanner and a ‘deal with it’ hashtag. 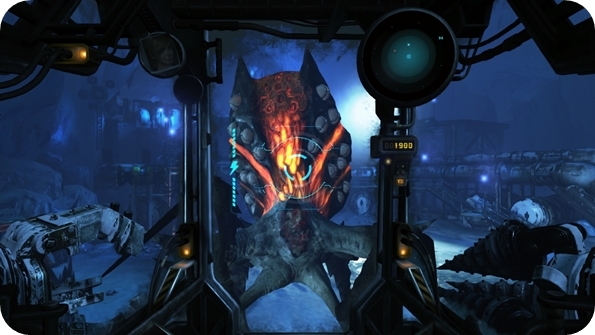 If you’ve played any other Lost Planet games, you’ll know what to expect, lots of aliens with glowing orange parts as their weak spot. Weapons are nothing to write home about, regular assault rifles, shotguns, slow rifles, grenades and the like. They can be upgraded with larger magazines and extra damage at least. The walking flower type enemies are easily dispatched with a few shots, but later Akrid will require careful aiming at their weak spots. The rolling armoured foes from past titles return, but the new twin-tailed panther-like creatures are new and can be tough to take down. For the most part though, old enemies are recycled shamelessly. Here I’d like to say that at least the boss fights match the high standards of the last two games. Sadly not, but at least they’re more fun on-foot as opposed to taking them on in the rig. They all feel the same. Be it giant crab, giant scorpion, bigger giant crab and so on. All can be defeated by dodge rolling and firing on obvious weak spots. A later one involves shooting egg sacks on its head, at least giving you something smaller to aim for and use a bit of skill. Bosses were huge in the previous games; I remember being blown away by the scale of some of them, as I had to use a grappling hook to get inside one of their mouths so I could mess it up from within. Spark has shown a complete lack of ambition here. Don’t even get me started on the last boss, which was by far the easiest in the game. With so little to look forward to, the game really plods along, with even the fast travel option not really helping to speed things up between areas. Thanks to the rig moving so slowly, it’s hard to gather enthusiasm for looking for hidden items too. If you have the time though, you can search for rare albino enemies for rich rewards like faster reloading and health regeneration. Searching out machine parts will enable you to upgrade your massively underpowered rig. You should do this for the extra armour alone. 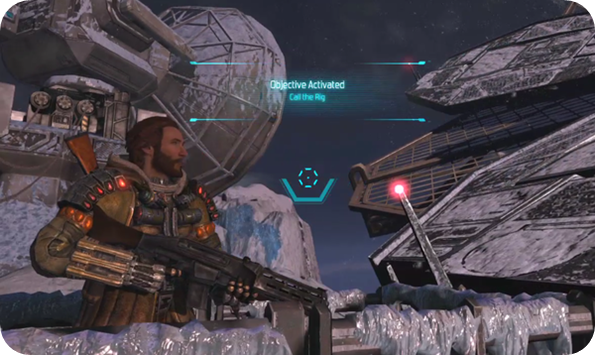 Lost Planet 3’s campaign can be raced through in little over ten hours, bulk this up to about 14 to find all the extra upgrades. Story aside though, there’s just so little to enjoy in the game. Too much travelling between gunfights just ruins the game’s chances of building any momentum. And with no epic boss fights to look forward to, you’ll begin to think Capcom should have left this one out in the cold. This leaves multiplayer with a hell of a lot of work to do. My hopes were raised by the return of the Vital Suits, smaller mechs armed with rockets and machine guns. These death-dealers are occasionally spawned at team bases for whoever can hop in first. On foot, opponents are no match head-on, but once they get behind you you’re easily destroyed. Game modes are what you’d expect with team deathmatches, extraction and base defences on offer. 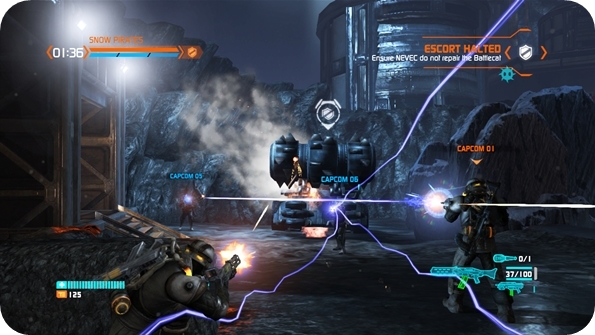 There’s also a 3vs3 survival mode where two teams take on waves of Akrid before fighting over a base in the middle. It’s all so very average, perhaps a standard survival mode would have fared better as it’s the nearest the game gets to co-op this time around. Technically, it’s a bit of a mess too, I was frequently teleported around the arena and a few of the bridges cause you to fall endlessly from the game world. 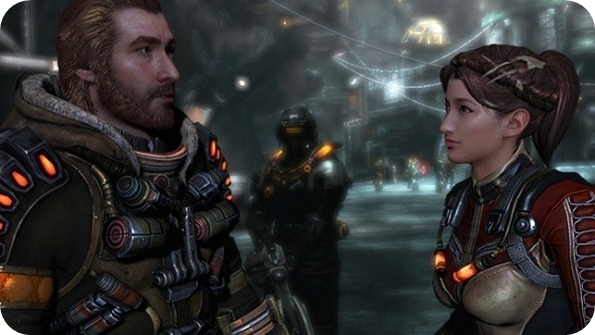 What happened Lost Planet, you used to be cool. Replacing Vital Suits for lumbering maintenance mechs was an awful choice, but the lack of decent boss fights robs the series of its core pleasure. The great characters enable the game to provide an interesting story, but it’s drowned out by mercilessly dull action.